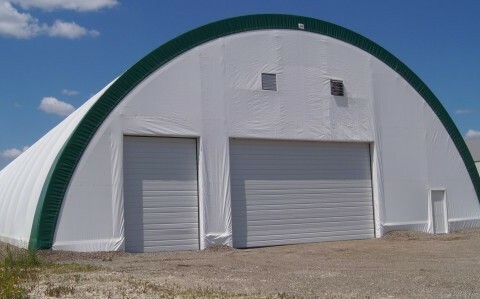 Will a FastCover Building work for my Dairy Barn? FastCover buildings provide a well lit and well ventilated dairy barn interior plus temperature moderation to help improve cow comfort. Cow comfort is an important factor in milk production and the bright interior of a FastCover building provides a daytime lighting that reduces the need for electricity and increaes the comfort level of your dairy cows. The fabric covers on our building allow for high amount of light transfer resulting in a soft, nearly shadow free interior, even on cloudy days. When daylight is no longer available to light your dairy barn, the bright white underside of the covers helps to reflect and disperse artificial lighting often requiring both fewer lights and using less electricity to light your barn. The high roof height of the buildings provides a large amount of air volume. The warmer moist air will rise to the highest points of the building and with properly positioned venting the air will be vented out with a venturi like effect, maintaining a cleaner, fresher air quality in the building. 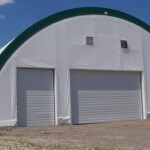 While letting through a tremendous amount of natural light, the covers of a FastCover building do not radiate heat and cold through to the interior of the barn in the same way other building materials do, such as steel. In the heat of summer, the covers block both the heat radiation as well as the UV rays making it cooler in the building and in the deep of winter, the covers do not radiate the extreme cold through the covers helping to keep the interior warmer. Our dairy building end walls can be configured to suit the needs of your dairy operations, such as overhead doors for your feeder equipment aligned to the drive alleys in your barn. Plan your dairy barn layouts for your operational style. 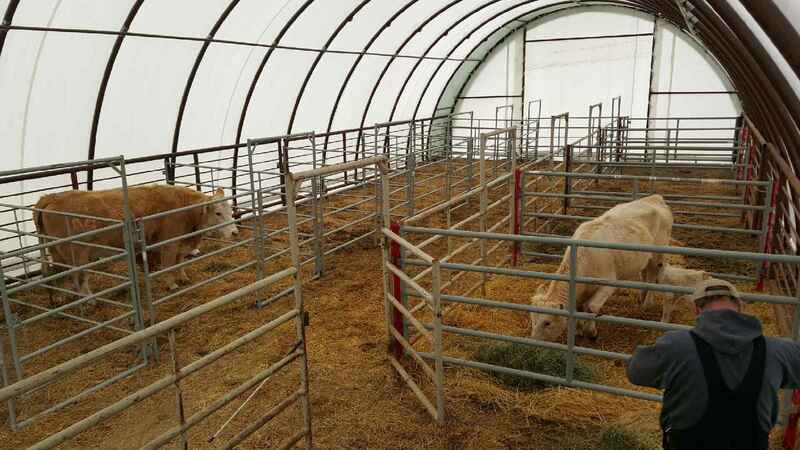 Two row free stall, three row free stall or 4 row free stalls, the choice is yours as all can be accommodated in our building lines from 40′ wide to 86′ wide and your dairy barn can be built to any length required to accommodate your herd size. 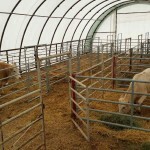 With the flexibility of design, a portion of the building can be uses a cow housing facility, or milking barn, while another section of the barn can be used as feed and equipment storage.